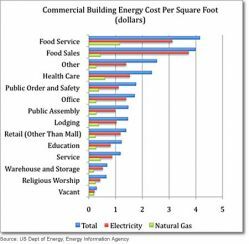 According to the US Department of Energy, Energy Information Agency, restaurants are the most energy intensive businesses, using 2.5 to 3 x the energy per square foot of a typical commercial facility. It is also generally the 3rd or 4th largest expense for a restaurant. And, yet, most restaurants treat energy as a non-controllable expense and do little if anything to try to reduce energy usage. In fact, there are inexpensive things a restaurant can do to lower energy usage, and those things can add up and have a huge effect. For example, for a restaurant with a 10% profit margin for which energy is 5% of total costs (not unusual), a 20% reduction in energy usage would increase profit by 10%. This Paper is intended as a very brief overview of some of the kinds of steps restaurants can take to lower energy costs.